Bell TV, formerly known as Bell ExpressVu, Dish Network Canada and ExpressVu Dish Network, is the division of Bell Canada that provides Direct-to-Home satellite television service across Canada. The service, which launched on September 10, 1997, has over 1.8 million subscribers and competes with satellite service Shaw Direct, as well as various cable and communications companies across Canada, such as Rogers Communications, Eastlink, Shaw Communications, and Vidéotron. Bell TV broadcasts from four geostationary satellites: Nimiq 1, 2, 3 and 4iR. Nimiq 4iR is temporary and is being replaced by Nimiq 4. All follow an equatorial path, giving coverage to most of Canada. Nimiq is an Inuktitut word for “that which unifies” and was chosen from a nationwide naming contest in 1998. The four satellites are owned and operated by Telesat Canada. Bell’s uplink site is located in North York which is in the Toronto area. A new direct broadcast satellite called Nimiq 6 is expected to launch in mid-2012 and will be fully leased for its lifetime by Bell TV. The satellite will be equipped with 32 Ku-band transponders and will have an anticipated lifespan of more than 15 years. It will be located at 91 degrees West Longitude. Bell TV satellite receivers are manufactured for Echostar. Models offered by Bell over the years include the models: 1000, 2700/2800/3700, 3000/3500, 4000/4500, 4700, 3100, 5100/5800/5900, 6000/6100/6141, and 9200/9242. Current models being sold include the 4100, 6131 and 9231. The 4100 is Bell TV’s current SD (Standard Definition) receiver. It is half the size of all previous basic receivers and provides a coaxial and RCA output. New to the basic model is an optical output for 5.1 surround sound purposes. The 6131 is a single tuner HD (high definition) satellite receiver offering both HDMI and component connectors. The 6131 also has a USB 2.0 port, which allows an external hard drive, upto 2 terabytes in capacity, to be attached to the unit, giving the 6131 PVR functionality. The 9241 is Bell TV’s HD PVR (personal video recorder). It has two HD tuners and can record either 200 hours of standard definition or 30 hours of HDTV. It is similar to the 9200/9242 but it has no OTA tuner. It is also possible to connect an external hard drive to the 9241 for additional capacity. Digital Home offers four discussion forums dedicated to Bell Satellite television. 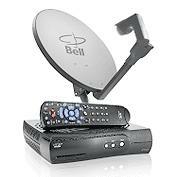 Bell TV forum – is for members to discuss Bell TV billing, programming and the use of standard definition receivers. Bell Satellite TV PVR, HD PVR and HD Receivers – is for the discussion of Bell HD Satellite receivers and Bell Personal Video Recorders including the 5000/6000/ and 9000 series receivers. Bell Satellite TV Hardware Installation Forum – is for troubleshooting and learning more information about the installation of Bell TV satellite equipment. Be sure to read our Index of Bell TV and DISH Network Installation Diagram’s before posting in this forum. The following Digital Home discussion forums also discuss Bell Canada products and services.